What a great rug to have in front of your fireplace. A beautiful Persian style hearth rug will certainly complement a traditional fireplace and become a great accent piece while protecting your floor from flying embers. With a roaring fire going, your pets will find this the perfect spot to nap and stay warm. Crafted in 100% virgin wool, you will be very pleased with the high quality workmanship, the rich and vibrant colors throughout, and the beautiful details in the Persian design. 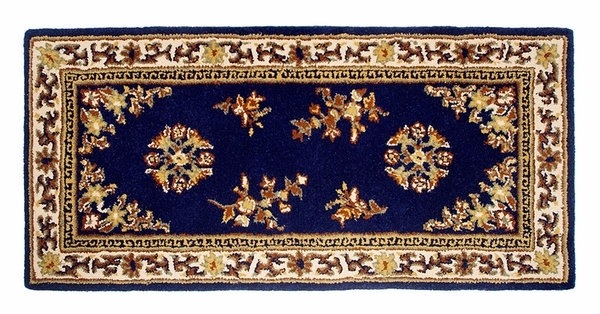 This rug can also be used anywhere in your home to add comfort, durability, and beauty. Available in half rounds or rectangles, they are also fire resistant. Is this rug fire resistant or fire proof? This rug is indeed fire resistant, though it is not completely fire proof. I ordered this rug after searching online for over an hour for just the right size and color. This rug is a perfect match for my decor and the size is perfect. The quality of the rug is excellent. When buying anything online I am always a little leery about how it will look in person. This rug did not disappoint me! It is more plush than my previous rug. I look forward to many years of enjoyment! We purchased this for our family room, in front of a wood burning fireplace. It looks great. We have not had a fire in the fireplace since receiving the rug so can't comment on how well it works when embers hit it. Will update in the fall/winter. We always seem to get what we need at a good price from your web site. Keep up the good work. We are fired up about this rug! It was the perfect rug for our hearth. The size and quality are top notch! I couldn't believe how thick the rug was. The shipping arrival went very quickly and now we can't wait for Fall! Now my husband can get rid of the many half circle rugs he had in front the fireplace! Shipped very quickly.Rug alot thicker than I had imagined(about 3/4").Dense,tight pile should provide plenty of protection for my floor,plus it looks great in front of my fireplace.Final test will be a hot coal, which I'm trying very careful not to do! I use this in front of my hearth (great at protecting from embers), and I have to say that the rug really pulls the room together.